If you crave tender, juicy pork ribs and you don't have all day, you can't go wrong with this Instant Pot version. The pressure cooker cooks the ribs to melt-in-your-mouth perfection in just 30 minutes. To get that charred look and barbecue flavor, pop them under the broiler for a few minutes or finish them on the grill. Use your favorite brand of barbecue sauce to finish the ribs or make a homemade sauce. This Memphis-style sauce is an excellent choice, and so is a "spirited" sauce, such as a tangy beer barbecue sauce or this bourbon barbecue sauce. You will notice a thin, silvery membrane on the underside of the ribs. If it isn't removed, it will stay tough and chewy and might prevent some of your dry rub spices from penetrating the meat. To remove the membrane, slide a butter knife under it on one end until you can grasp it. With a paper towel in hand (to keep it from slipping), slowly pull on the membrane to remove it in one piece. In a small bowl, combine the smoked paprika, chili powder, onion powder, dry mustard, garlic powder, salt, black pepper, and cayenne. Blend the spices thoroughly and then rub the mixture all over the ribs. Place a trivet in the Instant Pot and add the 1 cup of stock or water and the apple cider vinegar. Stand the ribs on end in the pot, coiling them to fit. Lock the lid in place and make sure the steam release valve is in the sealing position. Choose the pressure cook or manual function (high pressure) and set the time for 25 minutes. When the ribs are done, carefully turn the steam release valve to the venting position for a quick release. If your pressure cooker is not an Instant Pot, follow the manufacturer's directions for a quick release. Line a large baking sheet with foil and preheat the broiler (or grill). 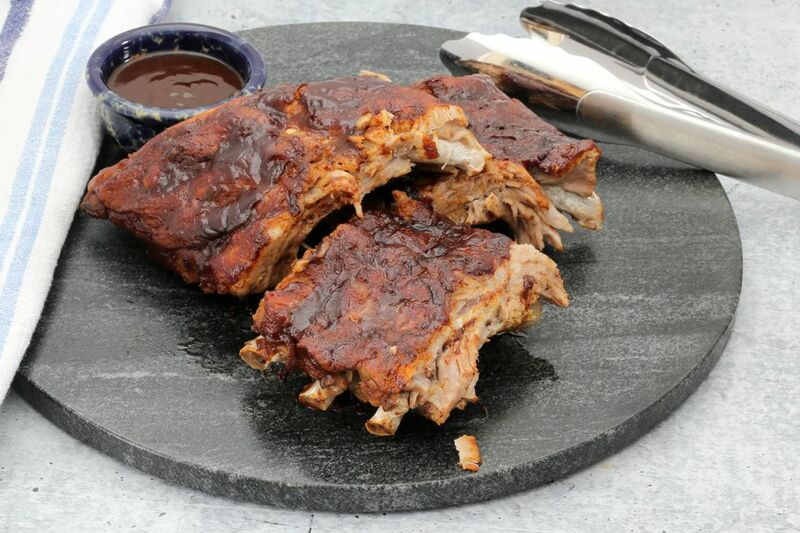 Remove the ribs to the prepared baking sheet and brush generously with barbecue sauce. Broil or grill the ribs until they are lightly charred. Slice the ribs into individual ribs or serving-size portions. When buying baby back ribs, plan on about 3/4 to 1 pound of ribs (raw) per person, depending on how meaty they are. When releasing the pressure on the Instant Pot, use the handle of a utensil and protect your hands. The steam is very hot! For sweeter ribs, add 1 to 2 tablespoons of brown sugar to the spice rub mixture.